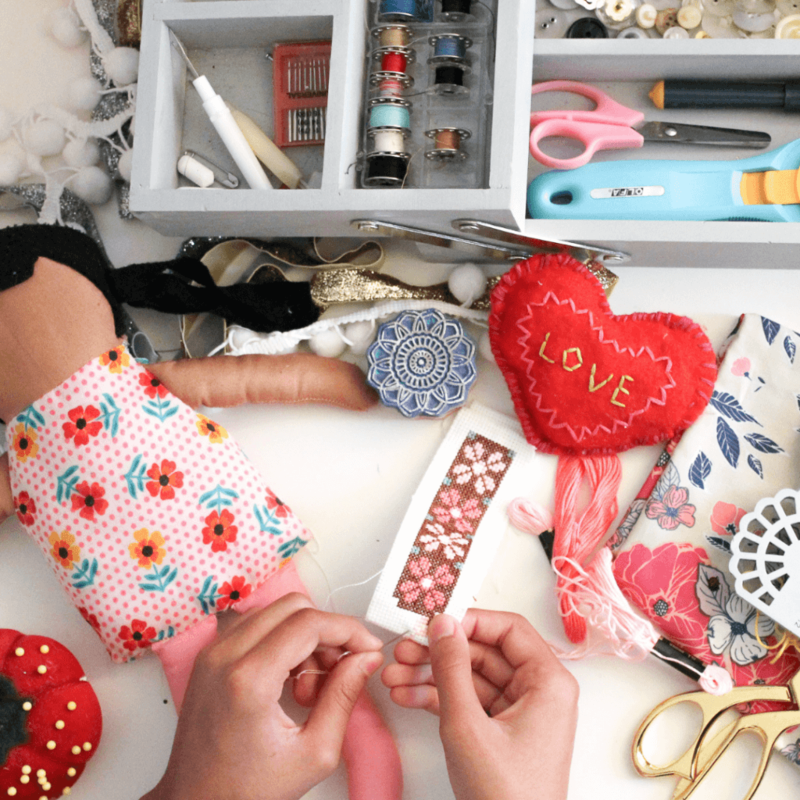 Evangeline Do of Handmade Beginnings shares 5 great tips to help teach sewing for kids. Plus enter a giveaway for a chance to win a spot in her www.sewing.camp. Hello, I’m so excited to be here! I am a long-time reader of The Artful Parent, and I’m so honored Jean invited me here to share about how to introduce sewing for kids! I’ll start by introducing myself. My name is Evangeline, and I am a mother of four. In my family, sewing skipped a generation so I didn’t learn to sew as a child, but instead I learned to sew in my high school fashion class. I’ve sewed ever since: creating clothing for myself, my kids, as well as handmade toys for my online shop. For the past 8 years, I taught children how to sew, whether it be to my younger brothers and sisters, my children, or students who come to my home studio for sewing lessons. Over the years, I’ve learned a lot about working with children and the best ways and ages to teach children how to sew. That being said, every parent and educator knows that each child is unique and will master skills and concepts in their own time. Some children will be ready for garment construction at age 8, and some will be ready at age 12. Neither is right nor wrong, and it’s always a good idea to follow the lead of the child. I always get to know my students at our first lessons together and get a feel for where they stand. Some children need five lessons on controlling the speed of the sewing machine pedal and threading a machine, while some master it on the first day. You can introduce new concepts by age but also be aware of their individual level and cater to that as no two children are alike. Learning to sew is also learning the art of patience. Sewing can often be frustrating and very time consuming. Helping kids break down projects into bite-sized steps can help boost their confidence and ensure they don’t get overwhelmed. I like to choose projects for my beginner students that I know they can complete within the 1-2 hour time frame of our class. This allows them take their project home and feel a sense of accomplishment. It also encourages an eagerness to return and create something new next week. Experienced sewers can sew more complex projects that span the course of a few weeks, but even then it is a good idea to break it into clear goals and benchmarks. Sewing mastery takes hours of practice. After sewing several hundred handmade toys, I can still say I have more to learn about sewing. The more children practice sewing techniques the better they will become at them. If your child is struggling with a certain technique, for example sewing on a button; try to give them multiple projects that incorporate buttons until they are confident with the skill. Or document the child’s progress by photographing their projects and returning to them a few months, or even a year later to see how far they’ve come. There’s a famous saying in the sewing world “Measure Twice, Cut Once” and it is for good reason. Mistakes are bound to happen. It is the very reason the seam ripper was invented. Teaching children how to undo their mistakes is just as important as teaching them how to sew. Even the most skilled seamstress makes mistakes and that’s okay. Become familiar with your sewing machine manual and or turn to Google if you get stuck. If your child is facing a sewing problem, it is a great opportunity to work through problem-solving and decide on the best course of action. Sometimes mistakes can’t be undone and there will be times when we need to start over, but that is all a part of the learning process. I’m really passionate about not just teaching kids to sew and follow a pattern step-by-step. I want to teach kids mastery of sewing skills so they can confidently design and sew their own masterpieces. If you give a child a paintbrush and paint, more often than not, you’d let the experience be open-ended. The child is allowed to paint whatever their heart desires. It’s important to be open in the same way with sewing. Once your child learns the basics of sewing, give some fabric and thread and room to create. Everyone’s uniqueness and brilliant ideas shine best when they are given the time and space to explore and play with materials. I hope you enjoyed my 5 best tips for introducing sewing to children. I love when I see more children learning how to sew. It is a bit of a lost art but is also definitely making a comeback! Do you have a child that is interested in learning how to sew? I’d love for you to follow along with me on Instagram where I share lots of sewing tips and projects made by children in my new online Sewing Camp program. Evangeline Do is an Early Childhood Educator with a passion for sewing and working with children. She blogs at www.handmadebeginnings.com where she shares her adventures in making, mothering, and homeschooling in Toronto with her husband and 4 kids. You can also find her on Instagram. She works at www.sewing.camp where she teaches online sewing classes to children. Evangeline is offering a three-month membership spot to her Sewing Camp for kids to one lucky family! Sewing Camp is a monthly, online membership program designed to instill creativity, build confidence, and teach sewing mastery to kids aged 8+. This online sewing program for kids includes: weekly video lessons and assignments, the chance to earn fun embroidered badges, a monthly magazine, and more! For a chance to win, leave a comment below to this blog post by Monday, October 8th, 11:59PM EST and check the box on the Rafflecopter widget saying that you’d like to enter. Giveaway open to readers around the world. I love that! There is something so special about the relationship and shared experiences between children and their Grandparents! How fun! Maybe I can learn, too. Thank you for the great tips! I’m really excited to try this online sewing program with such an experienced person :) It’s a perfect fit for our homeschool this year. I’d love to learn more too! I love the idea of making unique items! This is also a great idea because most schools have cancelled home- ec. You’re right! Home-ec is something that our children are often no longer able to experience. Their first encounter with sewing may be in high school or even further down the road as an adult. But there are so many kids who would love to learn! I’ve always wanted to learn and reading that you learned as a teenager gives me hope that I too can learn in my early 30s! Also, this seems like a nice way to bond with my son. Absolutely love the tips from Evangeline. Sewing is such an important skill to learn. My eldest learnt to quilt but would it for my other 3 to learn. Can’t wait to sign up for the sewing camp. It really is a fun way to bond with your kiddos. This looks SO fun! My daughter is big into sewing and she’d love this. Thanks for the opportunity. Wonderful tips! Basic sewing is a skill everyone should learn. I can’t wait for my 2 boys to learn sewing! I can’t wait for my little one to be old enough to learn inshAllah! thanks for this post! my daughter (5 years old) just asked if i could teach her how to sew when she gets older! but i can definitely start now, building concepts upon concepts! We are going to start Montessori sewing lessons for my 4 and 6 year old but I’m a bit overwhelmed if I’ll do it right with them. These online lessons will be a wonderful resource for us! My daughter has been asking to learn how to sew for months, so this would be a wonderful help! My 5 year old son would love to win this! This is wonderful! I love the structure of the camp. Would be perfect for our family! My 8-year-old has sewn a bit by hand and we’ve let it fall by the wayside, but she and I would both love to pick it up again! My daughters and I are slowly learning to sew, it’s awesome! Thank you for sharing this! This sounds like it’s going to be fun! I am giving my 8 year old daughter a sewing machine for Christmas and then teaching her how to sew. She wants to be a fashion designer when she grows up. She is always hand sewing random scrapts, old socks, scarves into cool new creations. She would love this membership. Great tips! My daughter loves to sew and just got my moms old machine as a birthday gift. She can’t wait to try it out. She would love and benefit from Sewing Camp. Ok I am commenting here because both my daughters would love this, hopefully I am entering correctly! What a fabulous article! I can’t wait to try these ideas out with my daughters. Do you know a good place to get quality felt for sewing online? The polyester stuff at my local sewing store is awful! Perhaps try Etsy, Ann? Or just google it? I’ve been able to buy good felt at my sewing store (as well as the polyester stuff), but I’m sure every store is different. Sewing with kids has been a brilliant activity for me to bond with my 11 year old. These tips are definitely going to be used in our household. I think we can combine these with our current sewing learning guide (Sewing Techniques from the Fashion Industry by Laurel Hoffman).